#NP: Tame Impala - "Apocalypse Dreams"
The words to describe the delicious, psychedelic sound within this song do not exist. You just have to listen and absorb it like a sponge. The first couple times you listen might take you places you never expected to go, but once you get back you'll feel better than ever. 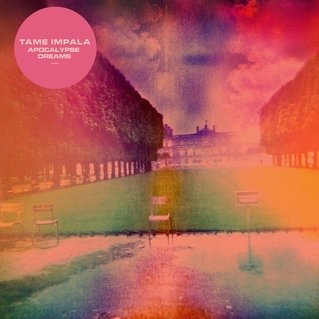 "Apocalypse Dreams" is the third track off of Tame Impala's awesome sophomore album, Lonerism, and it is one of the best songs I've heard this year. Few songs released in 2012 compare to this psych-rock epic. What I love so much about Lonerism is that throughout it Tame Impala mastermind Kevin Parker excels in three areas: songwriting, composition and sound. Those three elements are what make this song such a stunner. The guitar lines and analog synthesizers are incredibly beautiful and, combined with the thick layers of echo and reverb, create a sound that is mind-numbingly gorgeous. Yes, those are the perfect words to describe it. At first this song will be a lot to take in, but once you've listened a few times you find it becomes even better the more you analyze it. The lyrics fit perfectly with the track's ominous, psychedelic beauty. Parker is talking about having a vivid dream about the future where he achieves success and everything he desires in life. But, it's just a dream. Waking up to reality is a painful thing after that so he tries to retreat to the dream and recapture the feeling. After awhile, he realizes he can't and finds that the success he had in that dream isn't as meaningful to him as he thought it was. Life is about the journey, not the destination. When the guitars explode into the song's finale, he has destroyed his dream and is ready to face a reality full of possibilities. Parker romanticizes his internal struggles better than most contemporary artists. Take the journey with him on this song. You won't regret it. Listen and read along with the lyrics below. Are you too terrified to try your best? Do you really live without the fear?